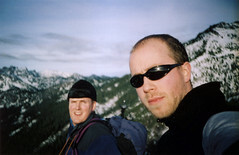 Dean and I slogged up Guye Peak this morning. What was usually a 3 hour round trip turned into a humbling 3 hour ascent, 30 minute break, and 45 minute descent. The weather was good, the snow was in fair shape for most of the trail, but we weren’t. The last time we’d done anything was last Thanksgiving morning, so to say we were hurting by the time we reached the summit would be an understatement. Up over a few more ridges, and then finally – on top. We were just about bonking, so we took our time up there and then hustled down with crampons in place and poles at the ready. There was a lot to get done today, but it was nice to start out the holiday with a little mileage behind us on Christmas Eve.